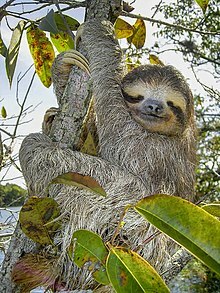 Sloths are hardy animals because the leaves they eat contain a kind of poison. They live completely upside down and move really slowly. The only time they come to the forest floor is when they defecate. Despite the fact that they move too slow, Sloths are good swimmers. There are Green Algae growing on a Sloth’s back. Weddell Seals are great survivors. They live in the coldest waters in the world. Baby Weddell Seals are amazing animals. They hold the record for the biggest temperature change experienced by any animal from the womb to the ice. Like Baby Weddell Seals, Baby Giraffes are great survivors. At birth, the young giraffe has to survive a six-foot fall because the mother cannot bend down and must learn to run just a few hours after being born to escape wild African predators. Giraffes are known to pick their nose with their tongue and they drool. As everybody knows, Cheetahs are the fastest cats ever. They can attain speed of up to 70 mph or 115 km/h. They hunt and eat gazelle, impala and warthogs. Female Cheetahs teach their rambunctious young how to hunt and must deal with bad kids for two years. The middle finger of the Aye-aye is bone-like, in getting their food from inside a tree limb. They look like a collection of leftover body parts. The collection of body parts perfectly helps it adapt to its environment. The male Bharal are naughty animals just like many species. They will try to push each other off mountains above 14,000 ft. high where they could fall at any time. Only half of the Bharal born each year survive to their first birthday. Tibetan Bharals have amazing hooves. They have to be good jumpers to fight on the edge of steep cliffs or else they’ll die. There are many animal stealers. One of them is the Fox. It steals eggs of different birds. What’s so amusing is that, it uses rocks to break the shell. Male Crested Black Macaques have a way of finding out who is the hottest female around. They can determine it through the female’s buttock –the larger the red buttock, the hotter the female is. Shrews have such a huge metabolism, quite unbelievable but their heart beats 600 times a minute. They are the busiest predators in the world and some species need to eat three times their own body weight in one day to survive. Klipspringers are among the greatest jumpers in the animal world. They can jump ten times their own height. If we were like a klipspringer, we could jump over the torch of the Statue of Liberty from the shoulder.